I was asked to write about the life I imagine in Nigeria. I always thought I will be prepared to write about this. I have always imagined that when the time comes for me to talk about how I want my Nigeria to look like, that I will know. I grew up a bit and took a few trips and realized, Oh! There is a different world out there where there is steady light, the taps work, cars stop for people to pass, people cared about people, and hospitals were efficient. My desires changed, I began to imagine that world being replicated here in Nigeria. I thirsted for a change. I preached the gospel and began to change my ignorant ways starting from not throwing out trash out the window of a car. I got happier and kept preaching but I was not satisfied. Why? Out of every 10 places I preached that change, I met 9 hungry people, 9 sad people, 9 people without hope or favours, 9 who have never imagined a better Nigeria, 9 who looked at me the way I looked at people I presumed privileged. Then I began to imagine a different Nigeria. What if there is a Nigeria that provides equity to all its citizens? A Nigeria where everyone will be given a chance based on merit? A Nigeria where the citizens believe that things can work without nepotism? A Nigeria that inspires hope? I began to imagine all possibilities. I got ideas, I penned them down as furiously as they came. I believed strongly that my imaginations set me apart. I imagined that my government needed my help. ‘Of course, they did not have ideas. Now I have it and they can implement it and all will be well again’ I said. I took my ideas to my government. I sat down daily and waited patiently but all I saw was the secretaries with the currency notes and the courtesies to the givers. I left and never came back after the third week. I am older and my imaginations fewer. I imagine a Nigeria where my children will feel safe to come home without looking over their shoulders. I imagine a Nigeria where the resources will be able to feed me, mine and yours without recourse to illegality. I imagine a Nigeria filled with trust for one another. That is the Nigeria I imagine at the moment. 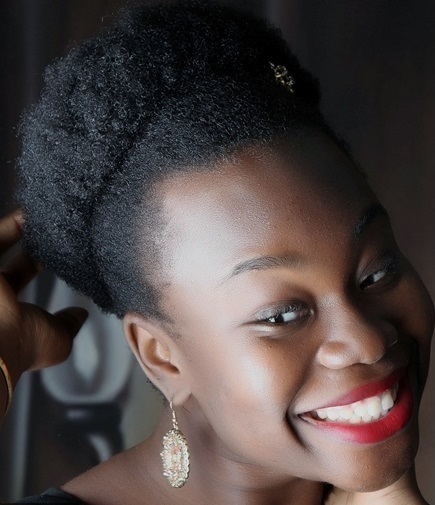 Nana Nwachukwu loves to read and practices law at her spare time. She is the current African Regional Representative of ITECHLaw Association. We’ve got an amazing choir in Church. Shout out to FWC choir. Just like a cook marinates meat before cooking, the choir has a way of preparing our hearts and setting it in tune for the move of the Holy Spirit. Most of the songs in my collection were gotten from listening to them. On one of those Sundays, a particular song was sang, you know that song that has been set to repeat in your heart, you just find yourself singing it on your way home, kitchen and even in the bathroom. Anyway I went ahead to download the song, since I didn’t know the name of the Artiste I simply typed the keyword of the song and two names popped up on the screen with the same song title. One was a Nigerian and the other an African American. I didn’t have to think twice, it had to be the African American and I clicked on play, and I heard something different and decided to listen to what the Nigerian had to offer and VOILA!!! that was the exact song I was looking for. I felt really ashamed and I’ve chosen not to mention the name, because there are lots of faithful who will crucify me. I apologize to you for not believing in your Star. I don’t have to tell you the person, but I know you are a fan and since we are all nice people I believe I’ve been forgiven. This brings me to the topic LOCAL CONTENT. How often have you found yourself in a similar situation? You go to the market, any you’re given one product with two different manufacturers, one local and the other foreign. Nine out of ten people go for the foreign product. What went wrong? We’ve lost confidence in ourselves as a nation. Foreigners have come and taken over the things we neglected. Take a look at Shea Butter, that’s a good body regimen. It’s exported, then it gets imported and sold to us. We only fall back to our Natural Resources when we see it’s thriving outside. The only true limitation we will experience as a nation, is that which we have placed on ourselves. We need to go back to the drawing board. The Government can’t give us everything. You want to make profit, you use sub-standard products that are cheaper for manufacturing, it’s sold, develops an electrical fault resulting to fire outbreak in the home, property worth of millions are lost, not to mention original certificates lost at the same time. Now you see, for as much as some chap out there made some “supposed” profit he has succeeded in passing a message of no confidence that’ll be passed onto generations . We blame the Government for everything, someone trips on the road because of a small stone and the next thing, abuses are rained on the Government. Can we just stop? Granted they’ve not lived up to expectations, but the question now is, how have you contributed in placing a bad tag on our country through your attitude, line of business and all. Let’s make a commitment to start regaining lost confidence in our country in our little sphere of influence. The land is green and fruitful.